The Horror Section: The Man On The Moon. 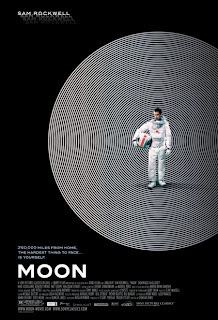 I’m going to take a little time here to talk about a film I saw last Thursday called Moon. I’d been really looking forward to seeing it since the trailer surfaced a few months back. If you haven’t seen the trailer, you can watch it here. However, I might suggest you refrain, so that if you see it the narrative will unfold as the protagonist experiences it. To be honest though, the trailer really doesn’t give away as much as it appears. Mining engineer Sam Bell (Sam Rockwell) is almost at the end of his solo three-year contract on the moon when things start to unravel for him. Is it cabin fever or something else entirely? Moon is excellent science-fiction, and like all great sci-fi its subject matter puts forth many questions. The strength of Moon is you are never sure where its going. You make the usual assumptions as you watch, but they continually change as the movie progresses. Moon’s influences are many, with 2001: A Space Odessey, Solaris and the 1981 Sean Connery vehicle Outland being chief among them. Like Sunshine in 2007, it takes its lofty predecessors and fuses them into an entirely new beast. Sam Rockwell’s performance is first-rate. He has to play his character two different ways and tackles the challenge beautifully. It really illustrated something – how people change over time – that I don’t think I’ve ever seen done this way before. 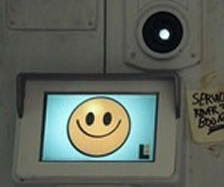 Kevin Spacey is great as the voice of Gerty, Sam’s helpful robot companion and it is the exchanges between the two that are some of the most engaging parts of the film. I’d wager a guess that this movie cost very little to make (by Hollywood standards anyway), but you’d never know it from the production values. The space stuff looks top notch. Director Duncan Jones does a great job with the pacing and really toys with your expectations of how the story will play out. Moon is one of those rare occasions where a film fully delivers on the promise of its trailer. If you are fan of straight up science-fiction, be sure to check Moon out when it releases wide this Friday. Looking forward to seeing this, very much. Sounds awesome. I love space-themed sci-fi like Sunshine. Is this actually in theaters or is it straight to DVD? It's been playing in limited release for a few weeks now, but I believe it's releasing wide tomorrow.